Play as Pudge the Butcher and kill other players with your infamous "Meat Hook". Use your gold for useful items, skills with good hook combos or upgrade your Meat Hook's damage or range. Experience the Dota 2 Pudge Gameplay on Warcraft 3. 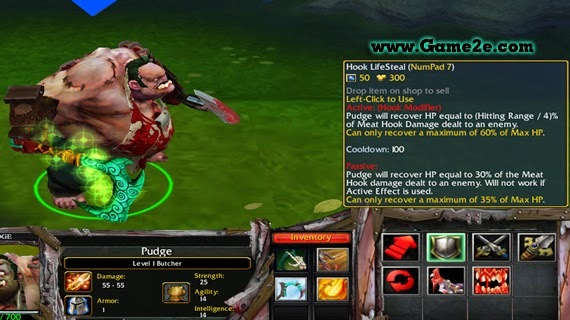 In Pudge Hook Wars, play as Pudge the Butcher with Dota 2 Graphics, Sounds and certain Items. Kill other players with your infamous Meat Hook as they roam the map. Players start with 2 Abilities (Meat Hook and Dismember). Abilities can be learned upon buying from the Abilities Shop which includes the "Rot" ability that allows you to perform the Pudge Standard 'Meat Hook - Rot - Dismember' Combo. There are also items that modifies your Pudge's Meat Hook (Hook Modifiers) such as Hook Lifesteal, Rupture Hook, Flaming Hook, Freezing Hook. Activating Hook Modifiers will change the appearance of your Meat Hook as seen below in the Screenshots. Meat Hook Damage, Range and Cooldown can also be permanently upgraded. Lastly, Runes appear in the map every minute except the first two minutes. These Runes (Hook Damage, Invisibility, Vision, Speed, Lightning, Vitality, Gold) are very useful and can define the outcome of the clash. It is recommended to store them in a Magic Bottle for timely use. - A lot of item varieties that modify your Meat Hook. - 6 Different Runes spawn every minute except the first two minutes. - 8 Buy-able Abilities that makes your Pudge unique to others and fits your gamestyle. - Strategic Items such as Observer Wards, Sentry Wards and Smoke of Deceit. - Includes famous Dota Items like Blink Dagger, Force Staff, Aghanim's Scepter, Blade Mail and many more. - A good human-like AI which can also be commanded if an ally. - Dota 2 Graphics and Sounds. * Easy AI takes normal experience and gold. It also has a poor Hook Targeting Accuracy. * Normal AI takes normal experience and gold but has a Human-Like Hook Targeting Accuracy. * Insane AI takes extra experience and gold and has an impossibly insane Blind Hook Target Guess but has a Human-Like Hook Targeting Accuracy.